I know, I know. It's been entirely too long since my last mix, but The Pregame was definitely worth the wait. I've got a fresh set-up courtesy of my new Pioneer DDJ-SX's and I'm ready for all my G's to hear what I've been cooking up. Whether you're having a ratchet night in or getting ready to head out tonight, enjoy! Featuring a handful of remixes, new music from and up and comers August Alsina, Forte Bowie and Alja KaMillion along with club favorites by T.I., Young Jeezy, and Wale, The Pregame is in full effect. I took a little sabbatical from blogging late last year to shift my focus a little more from reporting what kind of music was out there to creating. While I plan to continue sharing great music with all my loyal G's out there, look forward to more mixes which I intend to make better with each and every edition. During my brief break, I put together The Re-Up, which a lot of people seemed to enjoy and pass around. Since it's the weekend it's the perfect time to give this a spin and take a nice, healthy shot of Turnup juice. Check out the rest of the repertoire on Mixcloud and be sure to let your support be known! For bookings in Atlanta, St. Louis, Charlotte and the surrounding areas, email DJHourglass@gangstasuseemoticons.com. 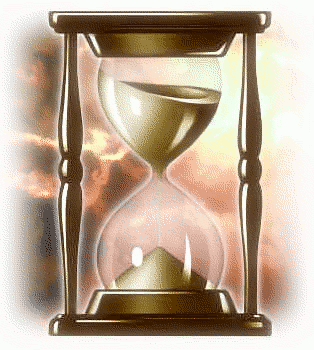 It's hourglass time! I know. I know. It's been FOREVER since I gave you a new GUE mix. Thankfully, there's been good reason for my hiatus. I've booked more gigs, I was promoted to Music Editor of TheWellVersed.com, revamped my look, and created an inaugural mix for TWV that has been streamed/downloaded over a total of 1000 times. Now that deserves a :-D.
To show my appreciation for all of those who have been riding with me (whether it was when I started the site last July or as recent as yesterday), I'm giving you nothing but over an hour and a half of party joints for your weekend. 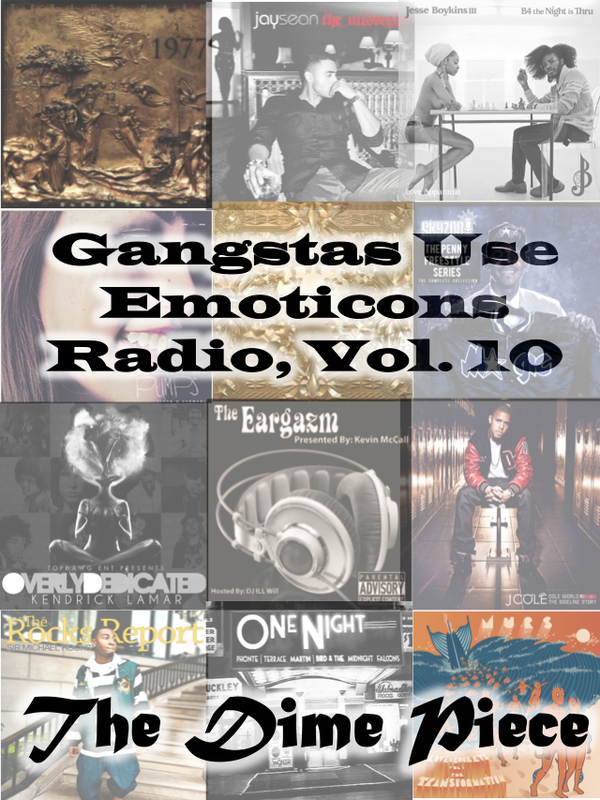 Enjoy Gangstas Use Emoticons Radio, Vol. 17 (inspired by my friend who just celebrated her 22nd birthday), which features new music from G.O.O.D. Music, Ab-Soul, 2 Chainz, DJ Drama, Rick Ross, Future, Kendrick Lamar, Big K.R.I.T., and more! Download and detailed track list after the jump. 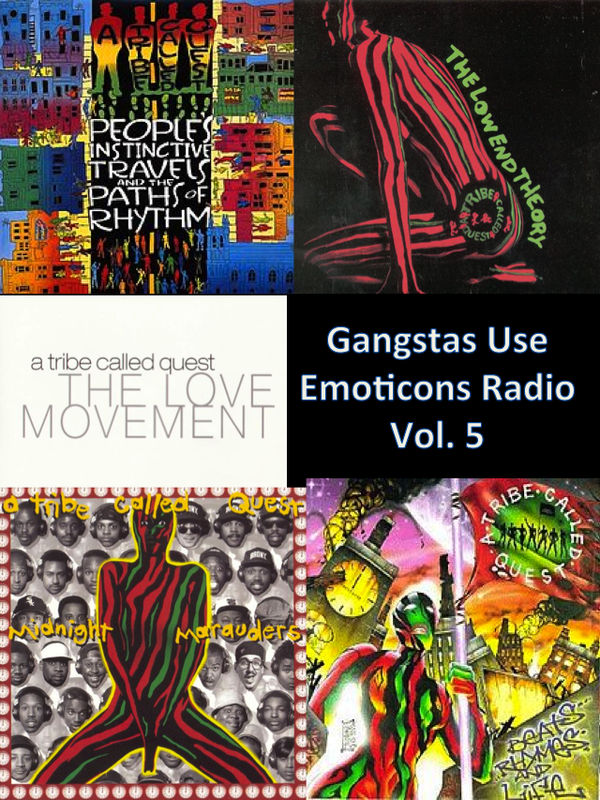 Gangstas Use Emoticons Radio, Vol. 16: Meet Glass! A LOT has changed since I dropped Gangstas Use Emoticons Radio, Vol. 15 in January. The site has grown tremendously and the most noticeable changes are the brand new logo, layout and mascot. You've probably already noticed him/her already, but consider GUE Radio, Vol. 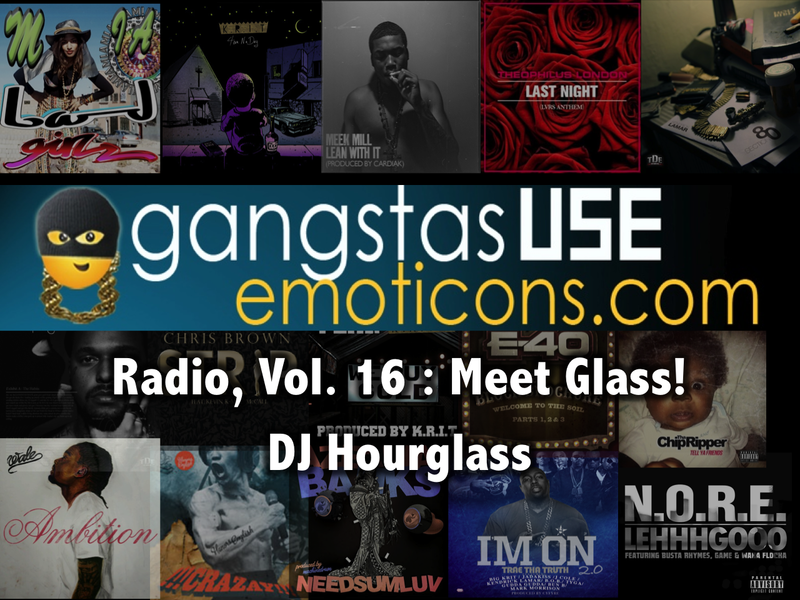 16 an introduction to Glass, The Gangsta Emoticon. Gangstas Use Emoticons Radio, Vol. 16 features much of the new music posted on the site within the past month, and like I always say, this one is my best mix yet. With a diverse selection of artists ranging from Big K.R.I.T. to Azealia Banks and Meek Mill to M.I.A., I think you'll really enjoy this one. Stream or download the mix below, and hit the jump for a detailed tracklisting! Hit up the comments with your thoughts and requests for the next mix! 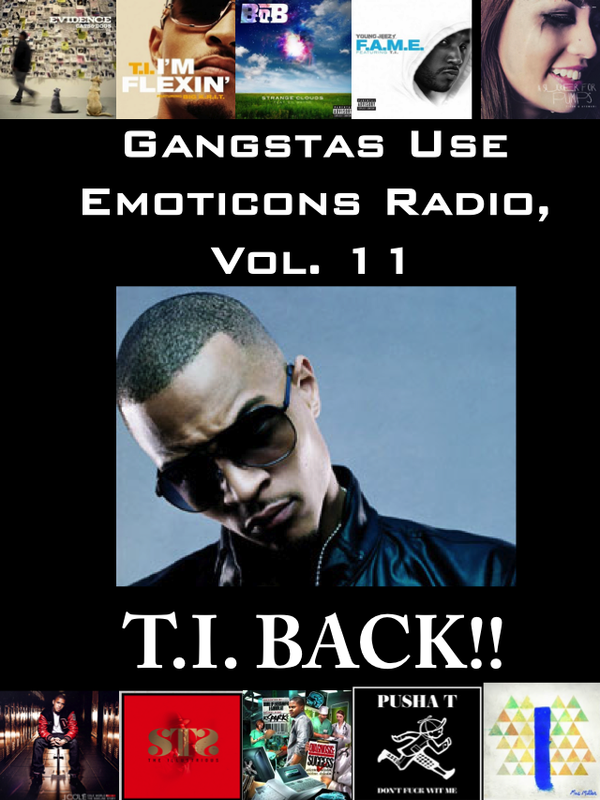 Gangstas Use Emoticons Radio, Vol. 15: It's A New Year Baby! It's been a while but Gangstas Use Emoticons Radio is back right in time for the new year! To celebrate 2012 AND the 6 Month Anniversary of the site, I decided to put straight party tracks on this mix. If you're looking for more indie tracks, check out the other editions! Thank you all for all of your support since I launched the site. This has been a huge learning experience and I'm still not close to bringing Gangstas Use Emoticons to its peak. I appreciate all you gangstas for riding with me through all the music, mixes, videos (and typos), and I'd love to hear any feedback that you have! Enjoy! Tracks from Nas, Ludacris, Wale, 50 Cent, Jay-Z & Kanye West, Young Jeezy, B.o.B, Andre 3000, Rihanna, Kendrick Lamar, and more!! Gangstas Use Emoticons Radio, Vol. 14: Mama, I Made It! A week ago, I finally put my money where my mouth is and purchased some digital turntables so that I could actually start practicing and getting ready for gigs. Hence, the title "Mama, I Made It!" I know I'm not at all where I dream of being, but I'm on my way! Check out Gangstas Use Emoticons Radio, Vol. 14 below, which features an assortment of new music including tracks from Rick Ross, Pac Div, Wale, The Roots, XV, Drake, Kevin Cossom, Jhené Aiko and more! I can't believe there are 13 of these now! Hip Hop has changed dramatically over the years--almost everything is digital now and rappers can make music to anything because creativity seems endless. I welcome these changes with open arms and although there are a lot of sh*tty artists clogging the Internet, there are also incredible talents that can reach a large audience easier than ever before. What few seem to notice is that the same movement is happening with R&B. There are tons of amazing singers and songwriters that are participating in the progressive evolution of this genre that seems to be expanding just as quickly as rap. I'd like to consider the standouts in R&B our "Leaders of the New School," although many who are just starting to gain major attention have been around in the industry for quite some time. 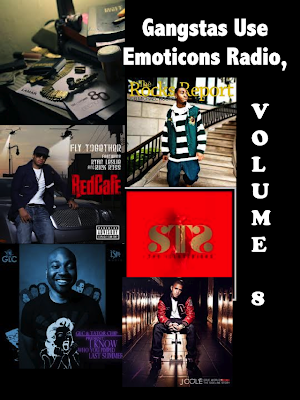 Check out a Gangstas Use Emoticons Radio, Vol. 13, a showcase of these R&B Leaders of the New School, which includes music from Miguel, Jhené Aiko, Teedra Moses, Frank Ocean, BJ The Chicago Kid, The Weeknd, and more! Gangstas, it's been a while! Soooo, yours truly, DJ Hourglass, decided to put something special together for Gangstas Use Emoticons Radio, Vol. 12. I present... Da Art of Storytelling (Part 1). Hip Hop storytelling is an art form that few rappers have mastered, but when done right, the story can be so clever or shocking that you're stuck sitting, thinking about it. Of course I included storytelling pros like Slick Rick, The Notorious B.I.G., Pac, Common and Nas, but there are some new names in the mix as well including J. Cole, Big K.R.I.T., and Kendrick Lamar. 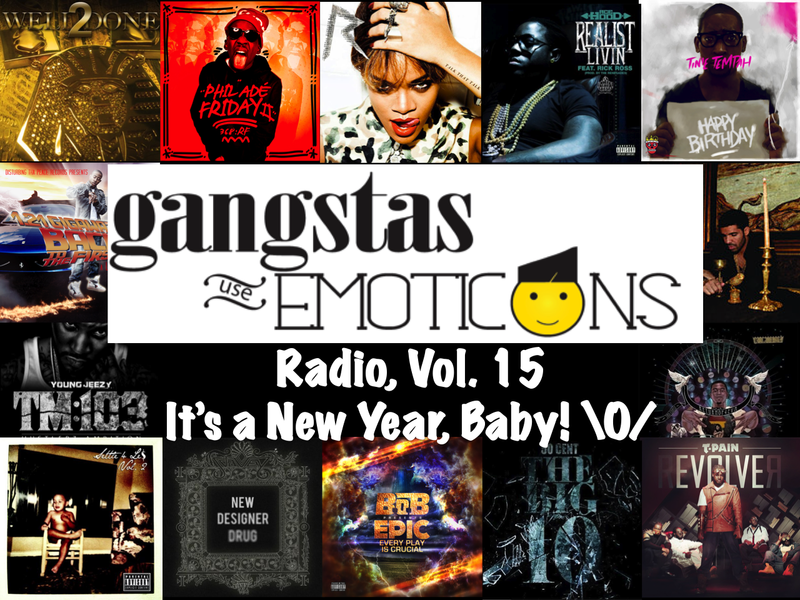 Check out Gangstas Use Emoticons Radio, Vol. 12: Da Art of Storytelling below and hit the jump for a full tracklisting! Gangstas Use Emoticons Radio, Vol. 11: T.I. Back!! 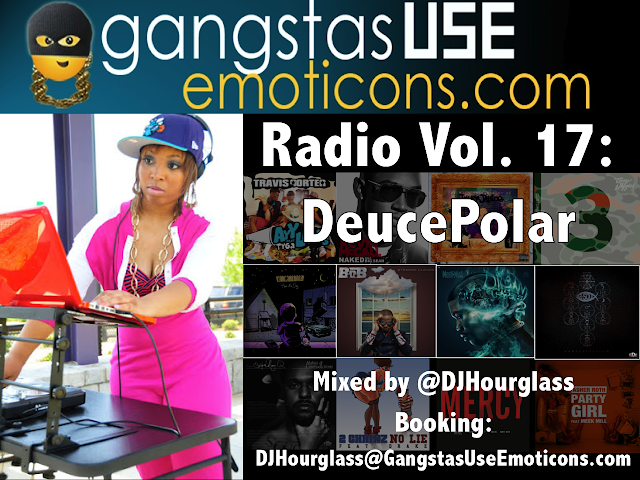 Yours truly DJ Hourglass is back after a short hiatus with Gangstas Use Emoticons Radio, Vol. 11!! What better chance than now while I'm in Atlanta to celebrate the fact that T.I.P. is out of jail and already dominating the internet and airwaves with his brand new verses? 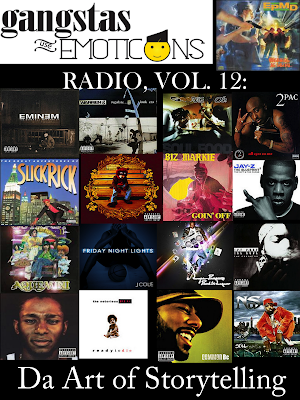 Listen to Volume 11 below which includes hot s**t from J. Cole, Wale, Big K.R.I.T., Evidence, Phonte, Pusha T, Mac Miller, B.o.B, 2 Chainz, and of course, T.I. Hit the jump for a full tracklisting! The weekend is here and yours truly, DJ Hourglass is back with yet another mix to get you going--whether you're planning to stay at home or go out and party. Thanks to your support, I've seen the demand for Gangstas Use Emoticons Radio, and I'm proud to have made 10 volumes in just two months. Since this is "The Dime Piece" edition, I switched up my usual format and made sure I got some smoother tracks and more R&B. Hip Hop heads, don't worry. It's still full of the hottest names in the game. Listen below and vibe to the sounds of TiRon & Ayomari, Drake, Kendrick Lamar, Terrace Martin, 9th Wonder, J. Cole, Dawn Richard and more! Hit the jump for the full tracklisting! This pretty much says it all for my definition for GUE Radio, Volume 9. Listen for yourselves and take a listen to artists like 9th Wonder, Big K.R.I.T., Jadakiss, Evidence, Wale, J. Cole, Thurzday, Erk The Jerk, TiRon & Ayomari, Fashawn, and more! Hit the jump for full tracklisting! It's officially Friday, so you know what that means! Yours truly, DJ Hourglass, is back with another mix to get your weekend started off right! I know I say this every week, but I think this is by far my best edition fo GUE Radio to date. It contains a balanced mix of mainstream party tracks, underground hip hop, and R&B. Listen to the mix below which features music from Jay-Z & Kanye West, STS, GLC, Phonte, Kendrick Lamar, The-Dream, Jhené Aiko, and more. Download if you like it!! Hit the jump for to see the full tracklisting! I know I said that I was going to release this at midnight, but after watching clips from tomorrow's BET's Aaliyah: One In A Million and reading Complex Mag's 10 Facts About Aaliyah You Might Not Know, the nostalgia just got too strong. Aaliyah, I didn't know you personally. However, thanks to your music, I was able to understand your immense talent and humility. To be so gifted and so humble is rare, and you showed me that despite my accomplishments, humility is the most important. I remember when I was 8, my sister recorded the video to Are You That Somebody and forced me to spend hours learning all of the choreography. I also remember crying with my sister when we learned of your tragic death on August 25, 2011. Although your journey on earth was premature, your legacy continues as is witnessed in the music of your successors and your peers. 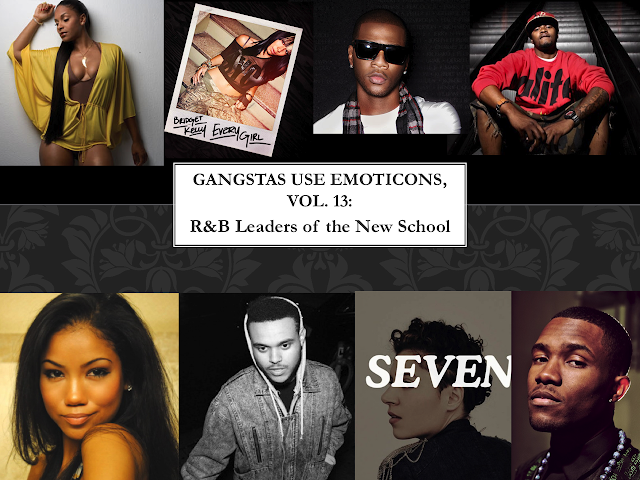 Gangstas Use Emoticons Radio, Volume 7 is dedicated to you, and includes samples of songs inspired by your music. Thank you for everything, Baby Girl. 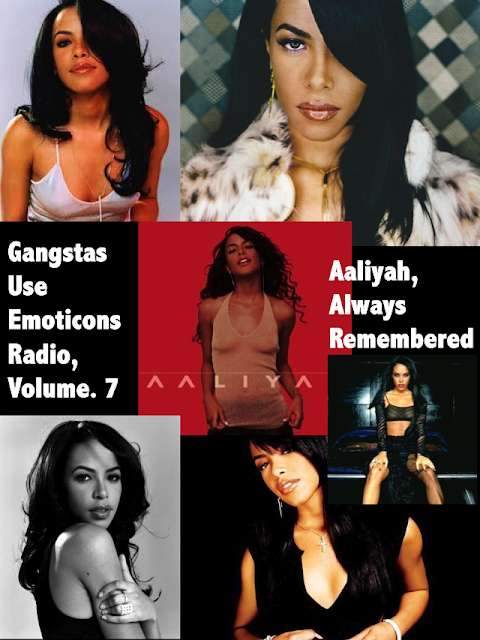 Gangstas Use Emoticons Radio, Volume 7: Aaliyah, Always Remembered is Coming Thursday! It's almost been 10 years since Aaliyah was taken from this earth. In celebration of her life and her music, make sure to stop by Gangstas Use Emoticons this Thursday for Volume 7: Aaliyah, Always Remembered. DJ Bankhead has officially retired. It was fun while it lasted, but I'm serious this time. The official, REAL DEAL stage name is............ DJ Hourglass! I've been doing tribute editions for the past 2 weeks and it's time to get back to that new s**t! This mix is probably the most well rounded--ranging from mainstream to underground, club bangers to love songs. Volume 6 features new music from artists including the Billboard toppers of The Throne, Big K.R.I.T., Meek Mill, and Wale. Also in the mix are two rappers from the 2 cities nearest to my heart--Charlotte and St. Louis. QC representer C-Weav is the founder of record label So Key Entertainment whose mixtape Mixed Feelings is a must download. Bryant Stewart, the hardest working rapper in St. Louis, just released "I Made This Last Week," a project which he made...in one week. Doesn't sound like it. Listen to DJ Hourglass's GUE Radio, Vol. 6 below! Make sure you hit the jump for the full tracklisting!! 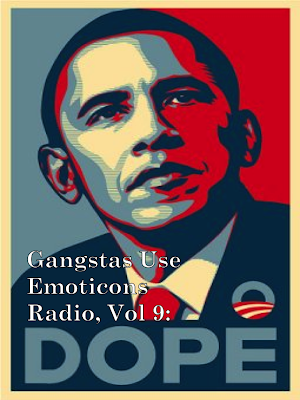 I was inspired to make Gangstas Use Emoticons Radio, Vol. 5 a tribute to A Tribe Called Quest after viewing their documentary. Beats, Rhymes & Life: The Travels of A Tribe Called Quest portrayed honestly and artistically the paths that brought Q-Tip, Phife Dawg, Ali Shaheed Muhammad, and Jarobi Brown together, kept them together, and split them apart. Just learning the story behind my favorite ATCQ songs inspired me to listen to their entire discography, and to dedicate Vol. 5 to them. If you're familiar with them, sit back and reminisce. If not, learn a bit and discover the main influence of today's biggest artists and producers. I also encourage you to visit RapGenius to get deeper into the lyrics and to contribute your knowledge. Listen below and hit the jump for the tracklisting! Since Watch The Throne will be released online in a few days on August 8 and in stores on August 12, I have to dedicate Gangstas Use Emoticons Radio, Vol. 4 to this momentous occasion in hip hop. No matter how you feel about either Jay-Z or Kanye, I'm pretty sure you're going to listen to Watch the Throne when it drops. It's been the most anticipated collaboration album of the year. This mix is an hour long journey through their collabos, features, and solo classics. Showcasing Hov and Ye from Reasonable Doubt/The College Dropout to the present, you're in for a mix that, at times, will have you sitting in deep thought, reciting lyrics, and slappin' snapbacks off. Listen/DL below and hit the jump for a full tracklisting. It's only an hour so maybe I'll do a Part 2 when Watch the Throne goes platinum or something. Gangstas, have I got a treat for you. GUE Radio is coming correct in time for Watch the Throne. In honor of the album dropping in less than a week (August 8), I put together an hour long mix of some of my favorite Hov & 'Ye collabos, solo tracks, and features. I put a lot of time in it, and I hope you'll love it. Gangstas Use Emoticons Radio, Vol. 4: Watch the Throne Edition drops tonight at midnight. Here it is! 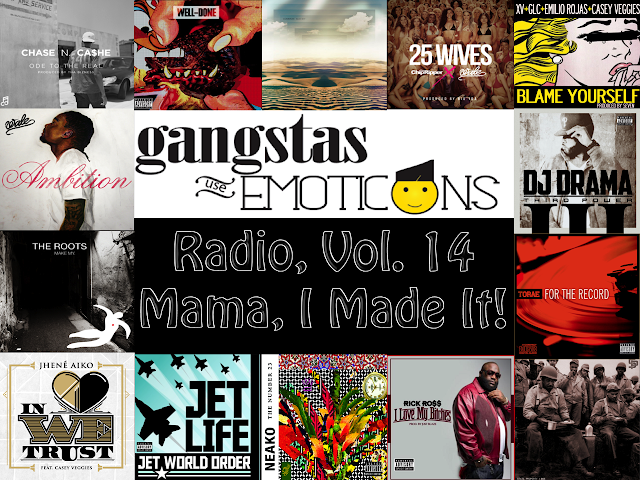 Gangsta Use Emoticons Radio is going Shawt Bus Shawty for Waka's retirement! As I stated earlier, I have no qualms with Waka for real; I think he knows his limitations just as much as I do. Sometimes you need a little simp in ya system. Listen/download below with new and old music from 2 Chainz (Titi Boi), Yung Joc, Lloyd, Tyga, Keri Hilson, Mr. Bricksquaaaad himself, and more.